A At 11:28 a.m. on Saturday, August 12, 2000, high in the Arctic Circle under the roiling surface of the unforgiving Barents Sea, Captain Gennady Lyachin was taking the Kursk, the pride of Russia’s elite Northern Fleet, through the last steps of firing a practice torpedo, part of an elaborate naval exercise. Suddenly, the torpedo exploded in a massive ?reball, instantly incinerating all seven men in the submarine’s forward compartment. The horror, however, was just beginning. The full, gripping story of the remarkable drama inside the Kursk and of the desperate rescue efforts has never been told—until now. Moore also vividly re-creates the nail-biting tension of the heroic but deeply flawed Russian rescue efforts as men are sent down again and again, aboard antiquated mini-subs, in perilous attempts to get to the survivors. As Western rescuers are at last called in, Moore richly describes the fascinating world of the offshore divers who drop everything to make one last, desperate attempt to reach the trapped submariners. 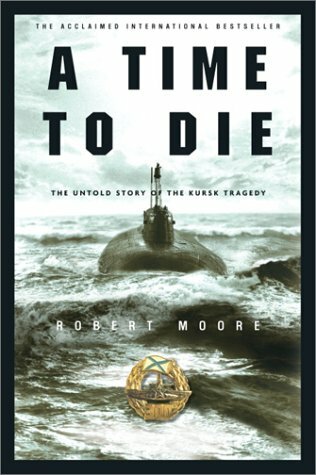 A Time to Die is a riveting, brilliantly researched account of the deadliest submarine disaster in history and its devastating human cost. This was a depressing book, but it was very insightful. It discussed submarines, the Russians, and other such things. This account takes place in 2000. Because of this, the book allowed me to see how far technology has come since then. This tragic event was caused by many things which made this historical event a bit more interesting to read about.